We would like to thank you for being a part of our senior capstone project. a successful, high quality, full service restaurant operation with motivated, organized employees. Our class has picked the theme "Flavors of the West Side" and is operating out of The Mastodon Grill inside the Coliseum Holiday Inn IPFW. We will be serving contemporary New York style food in a west side Manhattan atmosphere. If you could not attend the opening date, Tuesday, February 15, we still invite you to join us another Tuesday this semester. Thank you for your time and we hope to see you at The Mastodon Grill Tuesday between 5pm and 9pm. 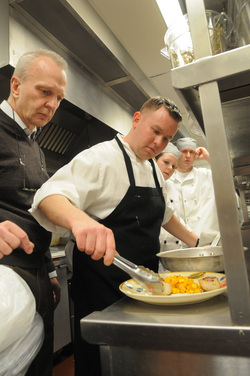 Here is the the kitchen crew, as Head Chef Cory preps an entree for service as Tosha, Mark (in the background) and Dr. Niser (in the foreground) look on. 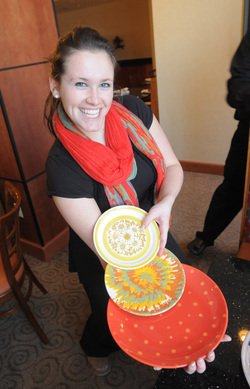 Here is our lovely General Manager displaying the array of eclectic plates we use for service. 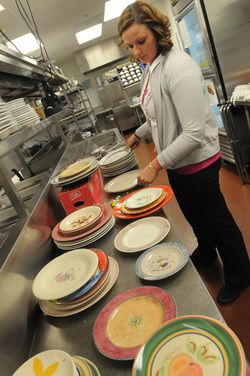 prepping the plates for service.